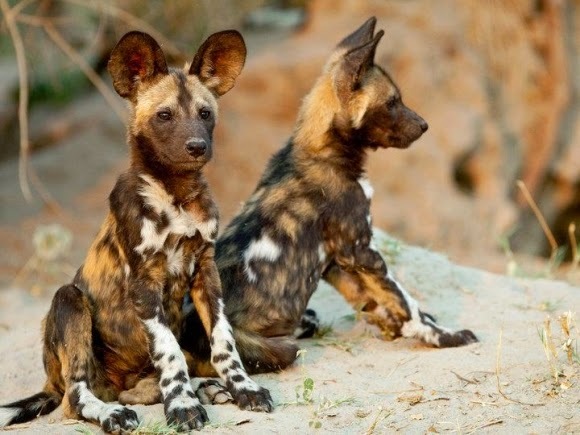 The African Wild Dog or Lycaon pictus (lay-key-on pict-us) is the only dog left in Africa today. No one knows how the Wild dogs' ancestors got to Africa, but its theorized that the dogs ancestors came during the ice age when it was easier to cross the water channels. If you look at this pups paws you will see that he has four toes on each paw, were as most canids have a thumb higher up on the ankle called a dewclaw Lycaon pictus doesn't. They have completely removed the thumb because it was a useless adaption. Like the stripes on a zebra, African Wild dog color patterns are never exactly the same, some think that its for camouflage in the undergrowth and grass but no one knows for sure. The pups though are all born black with a white-tipped tail. This is so they are hidden in the shadows, out of sight of predators like lions and leopards. 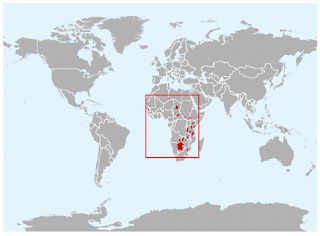 The range of the African Wild dog is going fast. in the past 10-20 years it has dropped around 85%, this leaves isolated pockets remaining making the risk of inbreeding and extinction present.